Picturesque mountains, a refreshing nip in the air and an evergreen wilderness. There is nothing more energizing, yet relaxing than a peaceful hill station. And what makes the stay even more memorable is the warmth and comfort of a charming resort. After a tour-packed day, it is imperative that you return back to splendid décor, satisfying service and elegant rooms; almost a home away from home. If comfort and class are your top picks for a resort, here are 10 of India’s finest hill station resorts that are a sight of their own. Gulmarg has been rightfully deemed as one of Asia’s foremost skiing destination, home to the world’ highest skiing lifts. The Khyber Resort offers the luxury necessary to match the awe of this place. The hotel rooms provide crystal clear views of the lofty mountains and pines. With lip-smacking delicacies, plus its own movie screening room, the Khyber resort possibly captivates you much more than its surroundings. Apart from skiing, you can also enjoy hot-air balloon rides and enchanting walks in the white and green landscape. The Oberoi Cecil, built 130 years ago, has been renovated into a modern masterpiece, complete with warm fireplaces, wooden floors and historical furniture. Located in one of the most popular hill stations of India, you can either visit monasteries, explore forests and the greenery or simply be mesmerized by the colonial charm of the resort. Against the backdrop of the magnificent Kanchenjunga mountain range, rests this historic Tea Estate and resort. The resort has luxury cottages, complete with private verandahs, for you to sip hot Darjeeling tea while marveling at the beauty of nature. The hotel offers their unique ‘tea experience,’ taking you for a walk in their expansive tea fields. This hotel also offers massage and beauty treatments, along with cookery classes for those who seem entrapped by the serenity of the hotel itself. For others, there are opportunities to go hiking and river rafting very close to the hotel. If the smell of coffee is enough to give you a kick in the morning, imagine being in the midst of a 70-acre coffee estate, for the ultimate coffee experience. That is exactly what the Serai has in store for you. 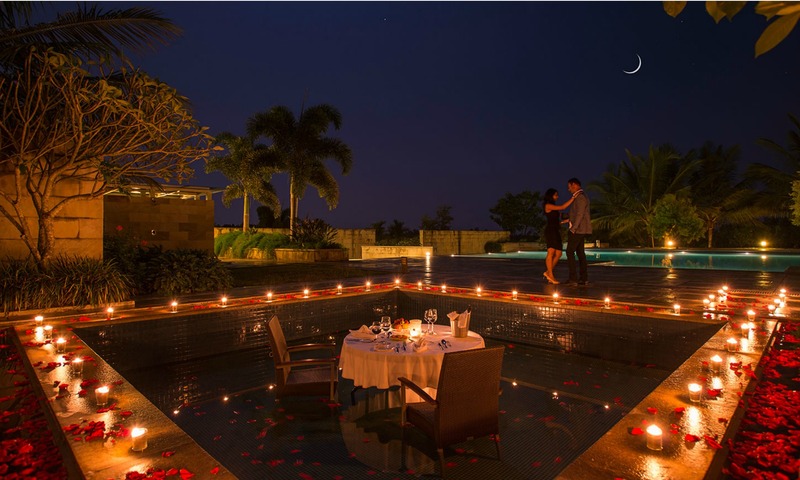 The villas of Serai are all endowed with private Jacuzzi or pool for a truly luxurious stay. Take in the scenic beauty of this place during morning hikes along the hill roads. Otherwise, pamper yourself at the spa with a unique coffee scrub or rejuvenate away in your deluxe villa. One of the 5 estates within the Binsar wildlife sanctuary, the Mary Budden Estate welcomes you to immerse yourself in its serene and tranquil environment. You can explore the wildlife sanctuary at leisure on day walks, unlike the typical jeep-safari offered in most sanctuaries. You can also visit Jageshwar and Chitai temple for a complete cultural experience. A visit to the hotel is sure to take you away from the bustling city-life, and into the soothing arms of Mother Nature. Credited as the most popular hill station resorts, the Himalayan is built in a Victorian Gothic-style architecture surrounded by apple and cherry orchards. The sights from its windows include snow covered mountains with specks of vibrant green and gushing cascades, enough to make you sigh in pleasure. The Himalayan’s blend of historic allure with its modern amenities are truly a class apart, making it the perfect place to enjoy a rejuvenating holiday. And if you’re looking for outdoor activities, Manali offers plenty; including mountain biking, river rafting and paragliding. Known for being a hub of adventure activities, Rishikesh also has something to propose to the luxury seekers. This resort provides individual and family cottages spread across two levels to allow for a wholesome private experience. They have a 24ft climbing wall on the premises staying true to Rishikesh’s adventurous spirit. Along with that, they also have a yoga centre and an astronomy getaway, to help you identify planets and constellations on a clear, starry night. Rokeby’s Manor promises to teleport you back in time the moment you set foot in its premises. Built in 1840, the present-day splendor retains the brick arches and stone walls for your delight. Enjoy the brewing cups of Darjeeling tea, nestled in front of a crackling fireplace, to relish the cool, breezy climate. Experience solitude in their lavishing library, housing varied collection of books to treat the book lover in you. You will be sure to remember the scent of pines and oak, and the touch of the wooden infrastructure long after you return back to your home. A heritage hotel, Fortune the Savoy has a regal history that dates back to the 1900s. A classic blend of old-world charm and contemporary luxuries, the service and the ambience is bound to make you feel like royalty. The hotel has a first-class restaurant offering delectable cuisines. It also provides its guests with a refreshing spa experience, along with a state of the art gymnasium. Originally the residence of Maharaja of Pilibhut, it is now deemed as one of the best heritage hotels of Nainital. Matching the magic of the lake city, this hotel offers breathtaking views of the Naini Lake. Housing royally furnished rooms overlooking beautiful landscapes, it is unparalleled in its hospitality and grandeur. These quaint hill station resorts assure you a satisfactory stay, so that no matter how cool and windy it gets high up in the mountains, you are always warm with hospitality and love. An expert vagabond with a wanderer’s soul, Rohit is on a mission to uncover all the untold travel experiences in India and share his tales at TransIndiaTravels.com.